Proposed event December 2019. Date to be arranged. Possible venue - the DW Stadium Complex. Turkey and Tinsel. Coach and Meal. When we left Hilton Street, it was looking a bit overcast, but by the time we had travelled to Port Sunlight the sun had come out and the model village was looking beautiful. Port Sunlight was built by the “Soap King” William Hesketh in 1888. The village was built to house Levers Sunlight Soap factory workers, but today it is home to a fascinating Museum, beautiful Architecture and a world class Art Gallery, stunning parkland and a thriving community. 1. 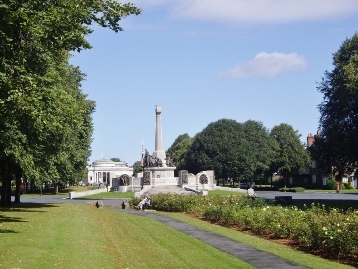 Explore Port Sunlight at war. 2. The events around the 1st gig The Beatles played with Ringo Starr which happened in the village. 3. A workers cottage has been re-created to show the visitors how the cottages would have looked in 1913 when they were first built. 4. We had a lovely day out, and I look forward to going again as I only covered a part of the village. Even with the delay coming home, it did not spoil our day out.